This has been a long day. Not for the reasons you might think. Don't get me wrong, I love the excitement of election day, but this year it has taken a back seat to the rest of my day. This afternoon my two boys were in the kitchen together. I should have known right there that something was wrong. When my two boys are being quite together something is brewing. I walk in and my youngest son is partially bald and surrounded by his cut hair. You guessed it, my oldest son had given his baby brother a haircut. Now on most boys this wouldn't be a huge deal, but my son had very long beautiful hair. He has always loved his hair long and cried as soon as he realized it was gone. Of course I was trying to figure out what my oldest son's reasoning was. When he finally told me I had to try not to laugh. Apparently my youngest son had been saying 'potty' words and my oldest decided that he needed to be punished...by cutting off all his hair. Gotta love kids! So tonight's blog post goes back a couple of weeks to a great stew recipe I tried. Last month I tried a new recipe for Squash and Lentil Stew from the October issue of Family Circle magazine, which looked perfect for fall. This recipe has 12 ingredients. It takes 56 minutes of cooking time and 20 minutes of prep and makes 6 servings. I had no problems finding any of the ingredients at my local grocery store. 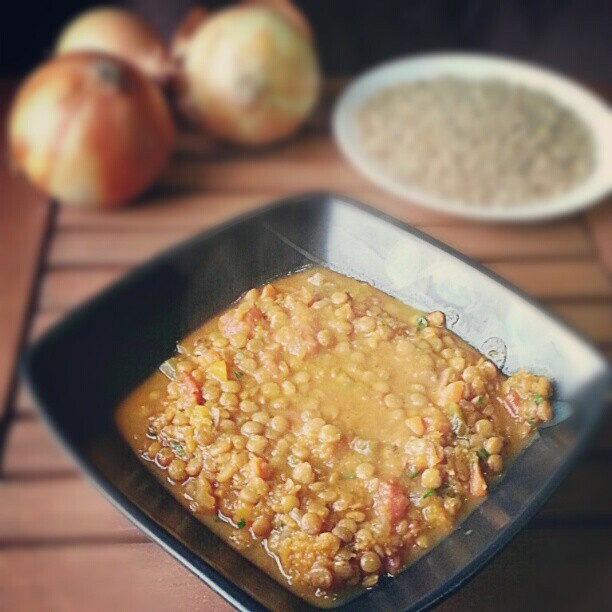 I have never seen French green lentils locally, so I used brown lentils instead. Instead of store bought chicken stock I used homemade. I don't salt my homemade stock, but instead salt the stew itself once it's finished. For the carrots I used baby carrots. I find baby carrots easier to deal with, especially since they are already peeled. I let my onion, celery and carrot mixture cook longer than the suggested 5 minutes by the recipe. Instead I allowed the mixture to fully soften. Make sure to fully salt the stew once it has completed cooking. Even with store bought stock this recipe will need a good amount of salt. I followed the remainder of the recipe as written. With 8 grams of fat and 17 grams of protein this recipe is a great low-fat meal. My two boys really liked the butternut squash and ate all of it in their servings. I liked that this stew is full of vegetables and beans and has a great flavor. I would suggest letting the stew cook slightly longer than the 40 minutes suggested in the recipe. I think it would allow the lentils to be even more tender and the flavors to fully incorporate. Overall, a great fall recipe.